The trailer mounted VER-T-LIFT can be used for loading and unloading heavy materials and equipment. Tools and supplies can be stored in the tool box for easy accessability on job sites. Have everything you need to get the job done on one trailer! 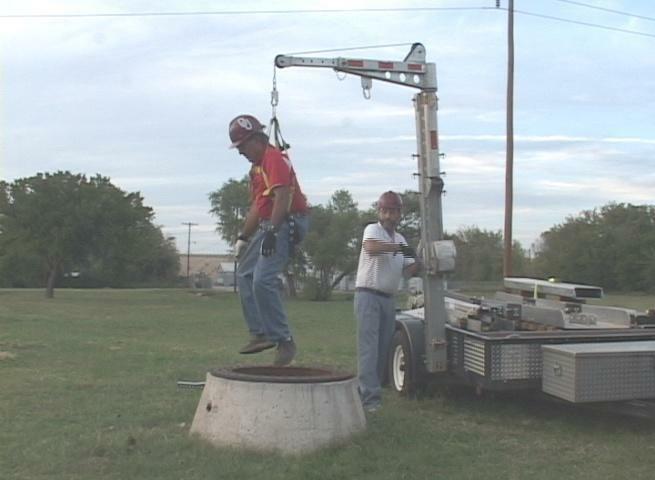 The trailer mounted Ver-T-Lift can be used for confined space entry. Easily maneuver the trailer close to the manhole or other confined spaces, erect the Ver-T-Lift arm in just minutes to enable a safe and OSHA compliant entry into a confined space. The two separate attachment points on the Ver-T-Lift arm allows you to raise and lower both personnel and material into the manhole. You can also load and unload materials from the trailer with the trailer mounted Ver-T-Lift.